I’ve been puzzling over some fellow critics’ reviews of two recent books about Dmitri Shostakovich — Solomon Volkov’s Shostakovich and Stalin and Malcolm Hamrick Brown’s anthology A Shostakovich Casebook. In particular, I’m surprised at the response, or lack of response, to Laurel Fay’s essay in the Casebook, in which Testimony, the dissident memoirs of Shostakovich as allegedly dictated to Volkov, is subjected to a vigorous forensic examination. A few months back, Edward Rothstein and Jeremy Eichler, two writers I admire, wrote pieces for the New York Times in which Fay’s findings were mentioned only in passing. Tim Page, a superb critic, reviewed the two books for The Washington Post and summarized the Casebook with the phrase “nits are picked.” I had a quite different reaction. Setting aside the usual questions of Shostakovich’s political orientation within the Soviet system, I found Fay’s essay a fascinating piece of detective work, and I think it deserves more than a word or two of paraphrase and/or dismissal. I will cover Bard College’s Shostakovich Festival for the New Yorker in August, and there I’ll try to sum up the state of the Shostakovich nation. Here I’ll delve into the details of Fay’s nit-picking and see where it leads. For those who don't know the backstory, the following may be pretty dense; for an in-depth treatment, read Paul Mitchinson's Lingua Franca piece from 2000. I felt a flush of embarrassment upon reading Fay’s essay, because I had been led to repeat something that was not true. Reproduced at the beginning of this entry, with the permission of Indiana University Press, are pages 2 and 3 of the typescript (click on the image to make it bigger). There is no signature on page 1; as you can see, it is found at the top of page 3. What appears precisely at the top of page 3? Another excerpt from previously published material — a memoir of childhood dating back to 1927. For those of you who have a copy of the book, this quotation begins at the bottom of the published page 4, with the words “I had not expressed a desire to study music…” The excerpt goes on for exactly one full typescript page. At the top of typescript page 4 (which was originally numbered “2,” suggesting that the first two pages were added later), the narrative returns to the familiar Testimony style — right in the middle of the sentence. Here is the 1927 essay: “Nevertheless, I continued composing and wrote a lot then. By February 1917 I became bored with studying with Gliasser. Then my Mother decided to present me and my sister to A. A. Rozanova….” Here is Testimony: “Nevertheless, I continued composing and wrote a lot then. By February 1917 I [here starts page 4] lost all interest in studying with Gliasser. He was a very self-confident but dull man. And his lectures already seemed ridiculous to me.” Notice how an innocuous recollection suddenly acquires that ad hominen, nasty tone which distinguishes Testimony throughout — and which so many of the composer’s close colleagues found unbelievable. How elegantly the signed page 3 is woven into the rest of the narrative: you don’t feel a jolt of transition. Fay has found that all the pages with Shostakovich’s signature contain nothing but old material. What’s more, she describes how sentences here and there have been dropped from the quoted essays, particularly those that would have given away the original date of composition. 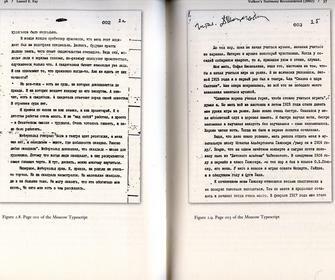 For example, a mention of the hundred anniversary of Chekhov’s birth disappears under correction tape; this would have dated the passage to the year 1960. The question rises once again: What manner of thing did Volkov ask Shostakovich to sign? 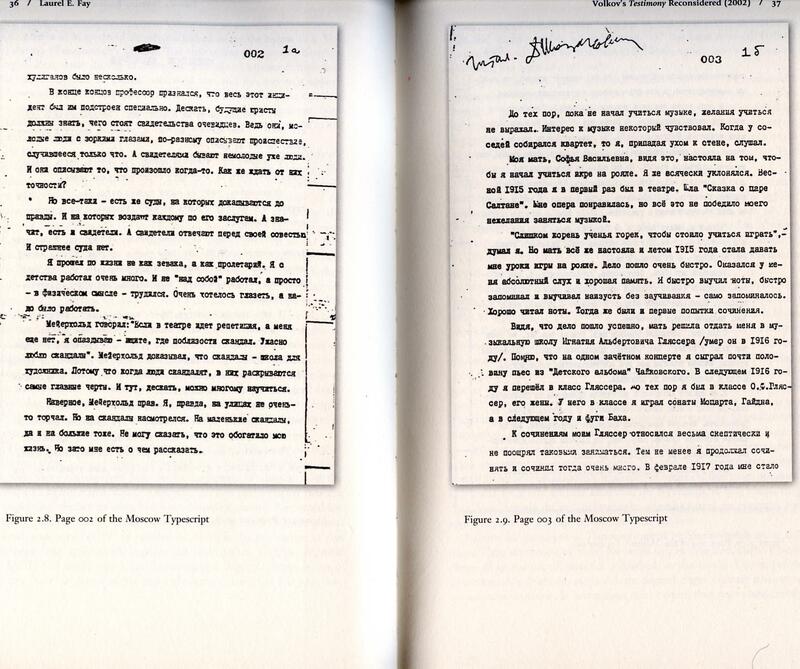 As far as I can tell, there is only one hypothesis for the defenders to fall back on: Shostakovich knew what Volkov was doing, knew that the old material was contained in the new, and signed those pages in order to give himself an out in case the typescript was discovered prematurely. “I signed a different document!” he could say. “Just a collection of essays!” We’re getting pretty far out on the grassy knoll. And it would be hard to advance such a hypothesis at this late hour because it would contradict everything Volkov has previously said about the provenance of Testimony. He insisted that Shostakovich read and signed the “true” typescript. He insisted that he had never read the previously published essays. In fact, as Fay points out, when one of them appeared in a 1974 issue of Sovetskaia muzyka, it carried an introduction by… S. Volkov.